CSO Insights research shows that sales team productivity improvement is a top sales leader priority. Lack of visibility into sales conversations through the customer lifecycle continues to cause revenue shortfalls. 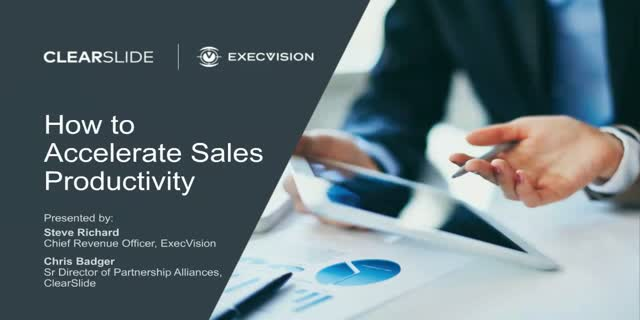 Hear how ClearSlide, the market leading sales engagement platform, and ExecVision, a conversation analytics platform, have integrated to break down these productivity barriers. See how sales leaders get real-time visibility into the effectiveness of their team’s recorded customer conversations to provide coaching opportunities. Magic happens when sales and marketing speak the same language around the management and execution of content. It changes the conversation. It moves away from the frustrating questions of "are sales using it?" and "is it resonating with buyers?" and moves to a data-based conversation around usage and engagement insights. If you can't make the date, sign-up and we will send you the recording. Exceptional coaching makes a big difference in sales. According to research from Sales Performance International (SPI), reps who receive “exceptional” sales coaching are 3X more likely to achieve quota than their peers who are coached less effectively. SPI’s research also reveals that exceptional coaches know not only how to coach but when to coach. The best organizations now use data and analytics to provide sales managers better insight on how to focus their coaching efforts on what matters most--at the right time. Join the SPI's VP of Business Development, Tim Sullivan, and the VP of Marketing at ClearSlide, Michael Schultz, in a dynamic discussion on injecting science into the art of sales coaching with data and analytics, and how investing in a sales engagement platform can be the game-changer. Top earning sales professionals are relentless, unstoppable prospectors, and obsessive about keeping their pipeline full of qualified opportunities. Renowned sales expert, Jeb Blount, teaches his secrets - real techniques that work with real prospects, in the real world. With insights from Jeb's latest book, Fanatical Prospecting, you'll learn how to keep your pipeline and bank account full. Very few teams have an easy time calling the number, let alone actually hitting it…or beating it. In fact, CSO Insights and Accenture report that nearly 60% of forecasted deals never close. Many teams struggle to execute during the critical opportunity-to-close process, including forecasting, which is far more than just rolling up a number -- It’s an integrated effort that involves all sales team members and leaders effectively managing their pipeline and confidently projecting where they're going to land. Listen in to a dynamic discussion among two top VPs of Sales of fast growing organizations, laying out their secrets to success and how they drive forecast accuracy and the sales process rigor required to scale and hit their revenue goals quarter after quarter. Spoiler: it's got everything to do with deal visibility and engagement data. For high performing sales teams, there is continuous measurement on email open rates, engagement, and response rates. How do you ensure a sales conversation keeps moving along? We’ll also be sharing some examples of real email templates to show you what to do and what to avoid in your own email outreach. Heather R Morgan is a former economist, and founder of SalesFolk. SalesFolk has helped more than 550 B2B companies scale their outbound sales efforts and set more appointments through leveraging persuasive copywriting, data science, and game theory. Heather also has a column with Inc Magazine and Forbes, and has also had her work featured on NBC, Entrepreneur.com, Harvard Business Review, Salesforce, Hubspot, InsideSales.com, and many others sources. Whether you are a company with 10 or 100,000 employees, when it comes to meeting with customers there's just one professional representing the great work of the whole. Learn how to bring your company's best to these critical interactions by creating a 'WOW' experience, and leverage innovative approaches to break through the noise. Join ClearSlide's Co-Founder and Chief Strategy Officer, Jim Benton, as he outlines the trends currently seen in the sales enablement and engagement space. Learn best-in-class approaches and researched tactics to create truly amazing sales experiences. Once upon a time, managing the content used to support b-to-b salespeople was purely a marketing function, and Sales Enablement practitioners were asked to do little more than house materials in an accessible location for reps to find. Join ClearSlide and SiriusDecisions’ Research Director, Peter Ostrow, in this informative webinar. Today’s prospects and customers expect a custom experience - whether they’re investing in a pizza, a car, or a sales solution. Generic presentations don’t stand a chance. But tailoring a sales presentation or crafting a targeted message for each opportunity is difficult. Sales leaders must be sure they’re equipping their teams with the solutions that tell you exactly how a prospect is interacting with your content, so communication can be personalized for the next best action. Tracking engagement enhances customized, guided selling in personalized sales presentations. These solutions provide the features that sellers want with the analytics that sales leaders demand to effective run their sales organizations. Forrester reports that less than 10% of sales leader have confidence in their sales activity data...that is a BIG problem for sales organizations. Sales leaders must be sure they are equipping their organizations with the proper tools to effectively measure the impact of their interactions with prospects in order to increase pipeline and close more deals. But how can sales teams be sure that the content and communications they're using with prospects is landing in a way that will garner next-step commitment and progress deals? In this webinar, sales leader Anthony Iannarino will demonstrate how to leverage sales engagement data to gain more commitments from prospect interactions to move deals forward. Anthony Iannarino is a renowned speaker, author, and sales leader. He travels the world educating people on sales best practices. He was named one of Forbes' Top 30 Social Salespeople in the World and is continuously shaping the conversation of what works and what doesn't in sales. Join us as we discuss the value that sales leaders, sales operations, and sales enablement are deriving from the latest advancements in AI and machine learning to improve sales engagement and success. Most sales teams are incorporating social selling into their overall selling process. The challenge for Sales and Marketing leaders is that empowering the organization for social selling is not a quick-fix or one-time training exercise. Teams that are successful define processes, establish consistent messaging, provide coaching, and measure program success. This impactful webinar features ClearSlide Sr. Director of Partner Alliances Chris Badger and FRONTLINE Selling EVP Kevin O’Nell. Both have helped developed successful social selling programs for a variety of organizations. Chris and Kevin will share best practice examples to establish social selling as an integral part of your company’s sales efforts. You want to fully leverage your results with Microsoft Dynamics. Below are 5 common questions asked by Microsoft Dynamics administrators--If any of these topics are on your mind, you won't want to miss this webinar. - Log all my activity without the manual data-entry? - Increase the quantity and quality of CRM-logged prospect activities? - Really tell if this forecasted deal will close? - Clearly see where my reps need coaching? - Get my reps to see Dynamics as a must-have for their success? ClearSlide for Microsoft Dynamics is the answer to these questions, transforming Microsoft Dynamics into the system of engagement that guides and records every prospect interaction. In this webinar, you’ll see ClearSlide for Microsoft Dynamics in action. Sales teams today are capturing more data than ever. The multitude of sales technologies leave teams swimming in data and attempting to measure everything - then lacking a clear idea of what to do with all of it. In fact, research shows that 83% of the metrics being used by sales leaders are unmanageable*, leaving managers at a disadvantage, even among this abundance of data. Sales leaders need to get back to the basics. Are your reps spending time with their buyers, and can you measure it? In this webinar, you will learn the modern sales metrics that will arm you with impactful coaching opportunities. Join LevelEleven CEO Bob Marsh and ClearSlide Sr. Director of Partner Alliances Chris Badger as they dig into the KPIs that matter, and how to drive the data that supports these findings. Register now to join the live session. Can’t attend? Fill out the form and we’ll send you the recording. Ever ponder these topics? If any of these questions are on your mind, you won't want to miss this webinar. • Log all my activity without the manual data-entry? • Really tell if this forecasted deal will close? • Focus my efforts on the people who are most likely to buy? • Find the content I need without all the digging? • Clearly see where my reps need coaching? • Get my reps to see Salesforce as a must-have for their success? ClearSlide for Salesforce is the answer to these questions, transforming Salesforce into the system that guides and drives every next action and decision. In this webinar, you’ll see ClearSlide for Salesforce in action – a 5-star rated app in the Salesforce AppExchange. Register now to join the live session. Join this webinar and see how the integration between ClearSlide and Sendbloom will transform the way you prospect. CSO Insights research shows 74% of organizations don't manage sales content effectively — reps waste 440 hours a year looking for content when they could be spending that time reaching prospects. ClearSlide has partnered with Sendbloom to seamlessly integrate ClearSlide's robust content management and customer engagement analytics with Sendbloom's automated prospecting campaigns. - Ensure your sales teams have the most impactful and up-to-date content tailored to prospect needs and account based marketing. - Leverage real-time notifications, analytics, and reporting to more effectively connect with and prioritize buyers. - Get direct insight into what content is working — and what isn't — so you can quickly refine campaigns. Register Now and see how ClearSlide and Sendbloom can transform the efficiency of your prospecting and drip campaigns. I’d like to invite you to join a live demo webcast of ClearSlide's new Polaris Release. If guided selling is a top priority this year, attending this hands-on session will give you a practical solution. Learn how our recommendation engine puts content in context, guiding reps through the sales process – surfacing approved ClearSlide content in Salesforce at exactly the right time. This gives marketers real-time insight on what content reps present and send customers, and how customers react. Learn how our recommendation engine puts content in context, guiding reps through the sales process – surfacing approved ClearSlide content in Salesforce at exactly the right time. This provides leaders confidence that their sales processes will be followed. There are also new dashboard views in Salesforce that help manage team and individual performance. How can you most effectively identify better talent, accelerate onboarding and get your new hires to achieve quota faster? Perhaps the worst kept secret in the corporate world is the level of frustration associated with trying to get an accurate revenue forecast from the sales organization. At every level, from the individual sales rep all the way to the CRO, there is typically as much guesswork as science involved in the process of predicting near term revenue. It is a problem that is relatively easy to solve. Join this 30 minute webinar to see how customer engagement data and an understanding of the customer’s decision journey can yield consistently more accurate forecasts, shorter sales cycles and better sales strategies. We will be exploring the latest technologies and best practices in the sales world.